Rwanda is a landlocked East African nation, surrounded by Uganda to the north, Tanzania to the east, the Democratic Republic of Congo to the west and Burundi to the south. Many Rwandan residents fled to these countries during the genocide of 1994, which lasted 100 days and claimed over 800,000 lives. 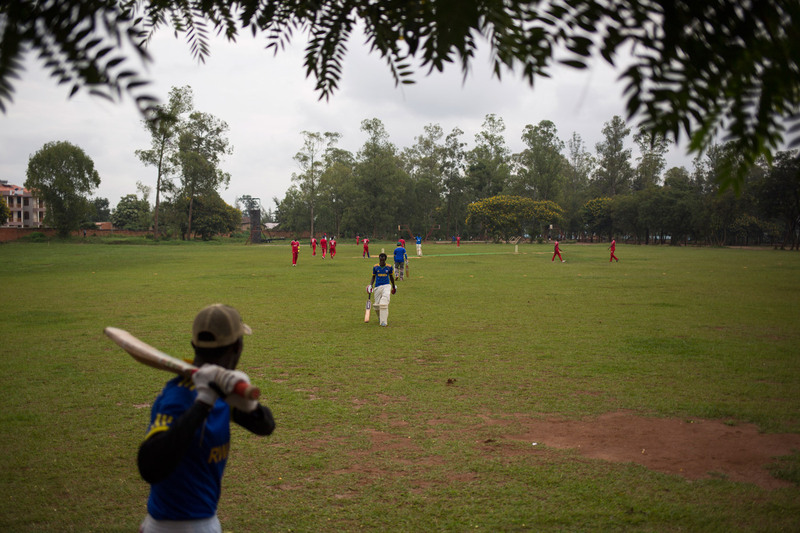 It was in Uganda, Tanzania, and further afield in Kenya, that some Rwandans learnt the game of cricket during that turmoil, and previously when people fled during violence in 1959. 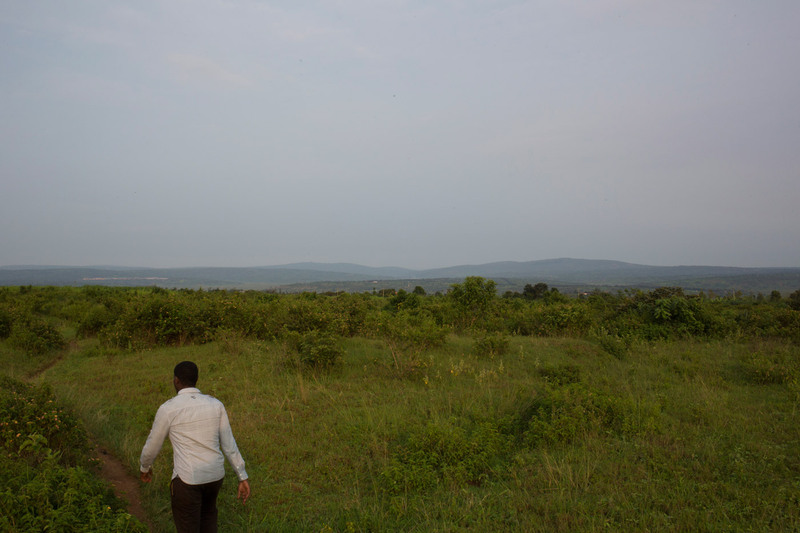 The game was then brought back to Rwanda, where it began in earnest around the year 2000. One of the pioneers, Charles Haba, now president of the Rwanda Cricket Association, wanted the sport to bring people together after 1994. "Time is the best healer, sporting or political," says Haba. "Some kids [playing cricket] weren't born then and shouldn't be burdened with their parents' troubles, but they have to understand it and move forward themselves." 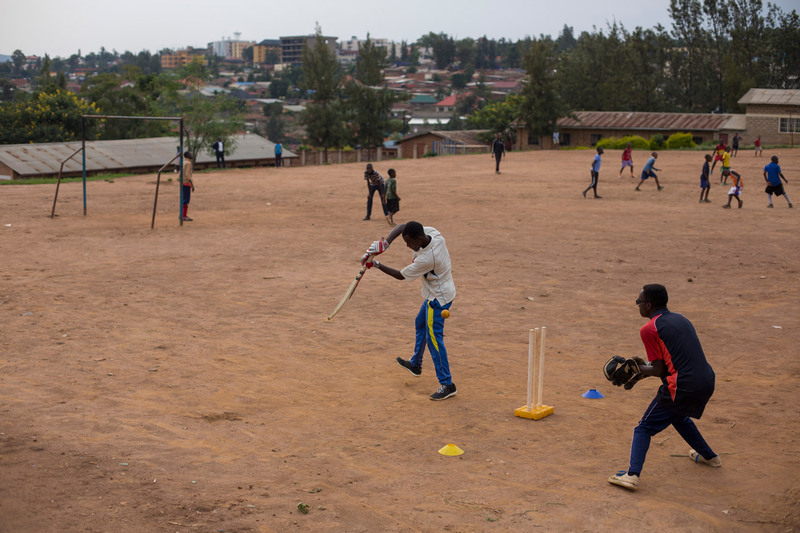 There is only one cricket pitch in the Rwandan capital of Kigali, but a new stadium, which is in the pipeline, is bound to boost the popularity of the sport in the country. 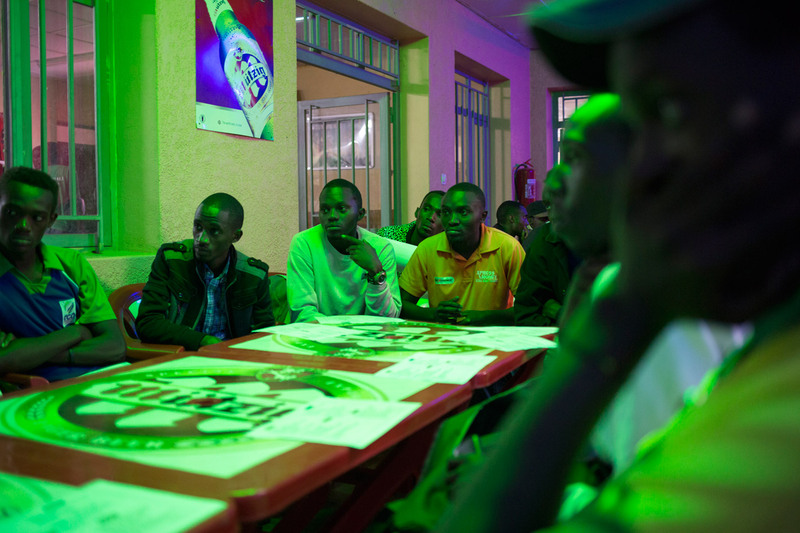 Players in Rwanda sometimes battle for space to play the game. 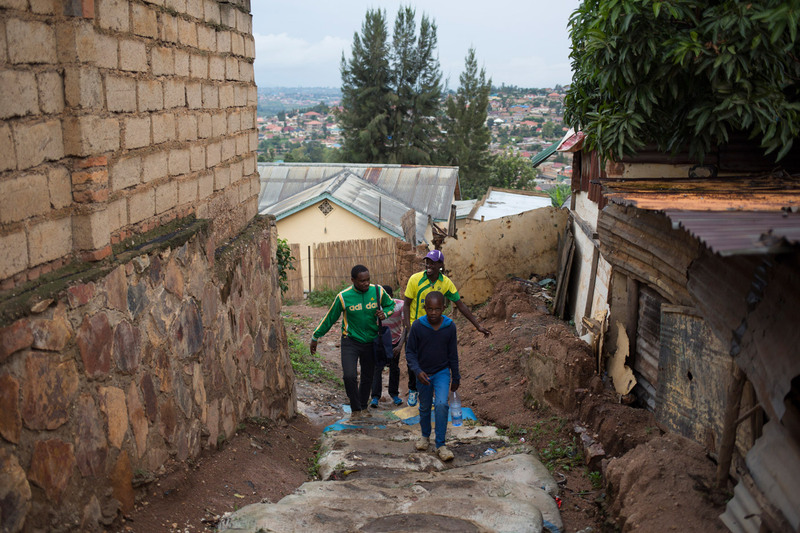 Kigali is mountainous, and as the city is still developing, infrastructure improvements are ongoing. Some houses do not have running water and some pathways are treacherous, especially in the rainy season. "We are constantly facing challenges," Eric Dusingizimana, the Rwanda captain, tells me. "Sometimes we get to the cricket ground and there are guys playing soccer on it. They don't really understand cricket and that we need the whole ground to play and train." New players are constantly being recruited to the game; many tag along with the senior players just to watch a training session. Football still dominates the sporting landscape in Rwanda. Cricket is looking to be their "second" sport. A London-based charity, Rwanda Cricket Stadium Foundation (RCSF), is raising funds for a world-class cricket stadium, and its patrons include Brian Lara and British prime minister David Cameron. 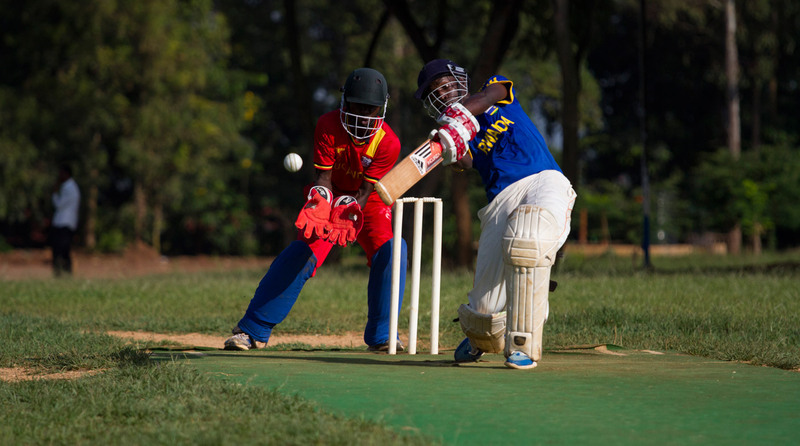 According to Haba, today over 5000 players enjoy the game of cricket in Rwanda. Dusingizimana warms up before their match against the Ugandan club team Kampala Institute of Cricket Club (KICC) in the picture above. Two T20 matches and one 50-over game were scheduled when I visited over the first weekend of April, before Rwanda embarked on their trip to South Africa to take on Sierra Leone and Mozambique in the ICC Africa Division T20 qualifier tournament. Uganda is an Associate member of the ICC, a step up from Rwanda, an Affiliate. Haba learnt to play cricket while he was in Uganda as a refugee after his parents fled there during the violence in 1959. When back in Rwanda, he decided to teach his countrymen the game. "The biggest challenge for us at the moment is facilities. Our ground is crap, so with the help of RCSF we hope to have world-class facilities soon." After training is cancelled due to rain, the team head to the local sports club bar, behind the football ground, built with FIFA support. "Our cricket ground used to be there, where the soccer pitch is," Haba tells me. "But we were shifted further away, as we didn't have the resources to put up a fight." The team listen to their coach, Davis Turinawe, a former Uganda player and coach. They go over tactics. The emphasis is on "sticking to the plan" when they play next. The lone cricket pitch in Kigali is located at the Integrated Polytechnic Regional Centre (IPRC). Formerly a secondary school called Ecole Technique Officielle, IPRC is now a university. These grounds, which used to be forest and bush, have a harrowing past - they served as a spot of refuge for many during the genocide. According to a UN Security Council report, over 2000 people sought refuge in the grounds as they were protected by the United Nations Assistance Mission for Rwanda (UNAMIR). Following the murder of ten Belgian soldiers, the UNAMIR force left, "leaving behind men, women and children, many of whom were massacred by the waiting soldiers and militia". Survivors, according to media reports, were then marched to nearby Nyanza, to a rubbish dump, to be killed there. 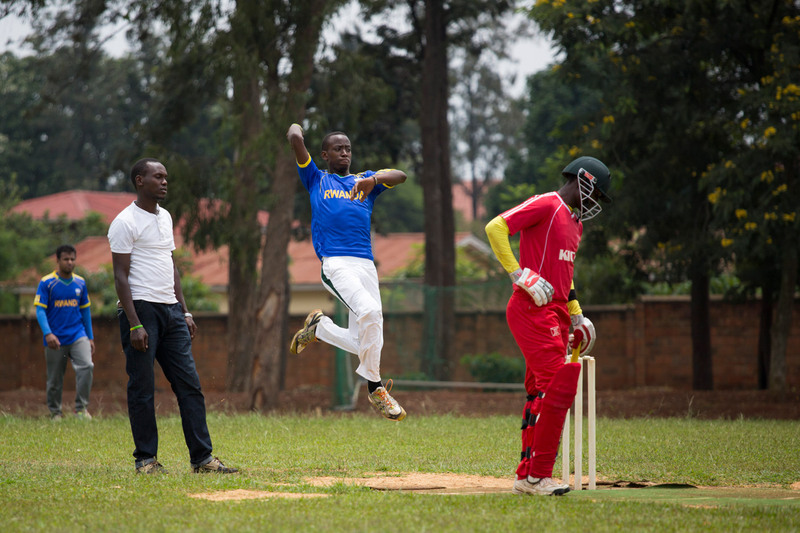 Fast bowler Freddy Ndayisenga, 23, started playing cricket in 2009 after a current team-mate, "Tall" Eric Dusabemungu Hirwa, helped with the technical side of his action and another team-mate, Andre Kayitera, pushed him along. "I lost my sister, her husband and their child during the genocide of 1994," says Ndayisenga. "I was born in Burundi after my parents fled there during the violence of 1959, but my sister stayed in Rwanda. They took my sister's husband and baby, and when the baby asked why they weren't taking mum, the killers knew my sister was hiding in the house. They used a machete to kill them all." Now cricket is Ndayisenga's family. "Cricket brings people together," he says. "We are no longer Hutus or Tutsis." 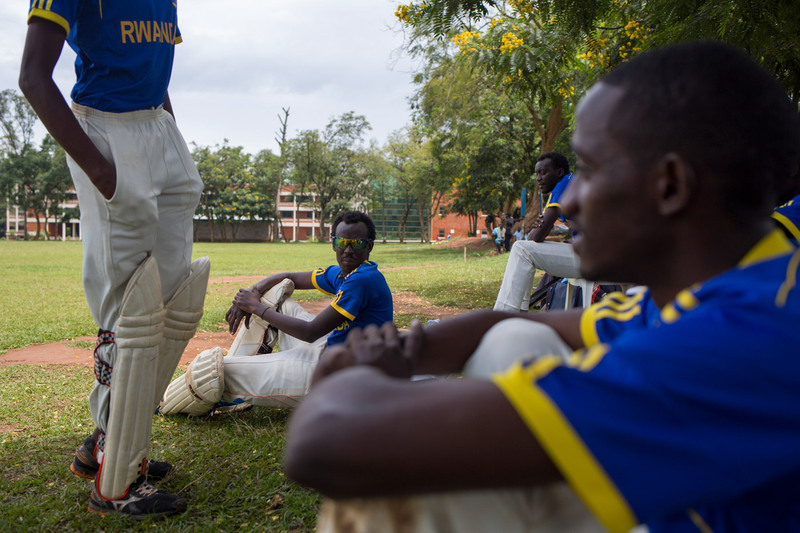 Rwandan batsmen await their turn to bat against KICC. The team do not have changing rooms, or even shelter, even during the very hot months and the rainy season. The whole team is amateur and the players work day jobs, playing and training for cricket after work and on weekends. Many of the players aspire to become professional and play at the highest level. Most of the money allocated to Rwanda is spent on playing tournaments against other Affiliate teams, all aiming to move up to Associate status. 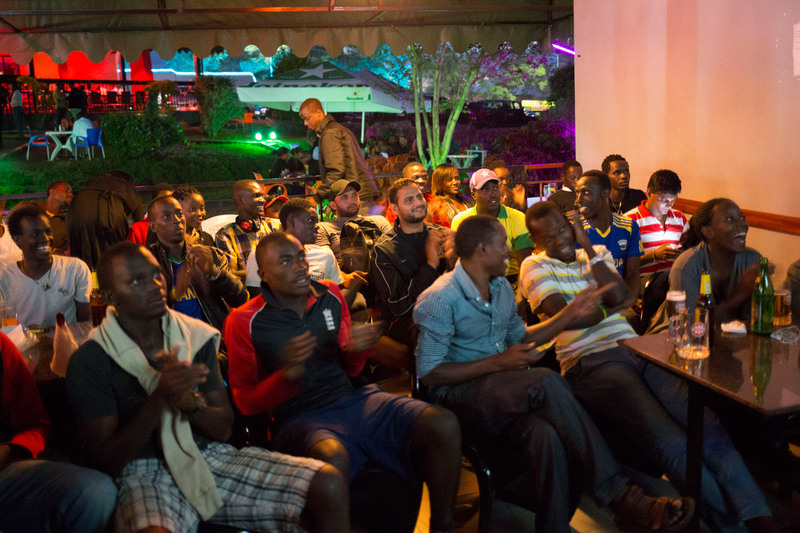 Players from both the Rwandan national team and KICC are glued to the television at a bar called Plus 250. Walking distance from the Kigali cricket pitch in Kicukiro District, the bar is a favourite haunt for players to watch international cricket. "We used to turn up here and ask for the channel to be turned from English Premier League football to cricket, but the guys here would not," says Dusingizimana. "But now we turn up all the time to watch, so they know we are serious about our game." Rwandan batsman Bob Songa Bashir lofts a drive in a game against KICC. The team practises on the same concrete pitch on which they play, covering it with carpet and with a net going up behind one of the ends. 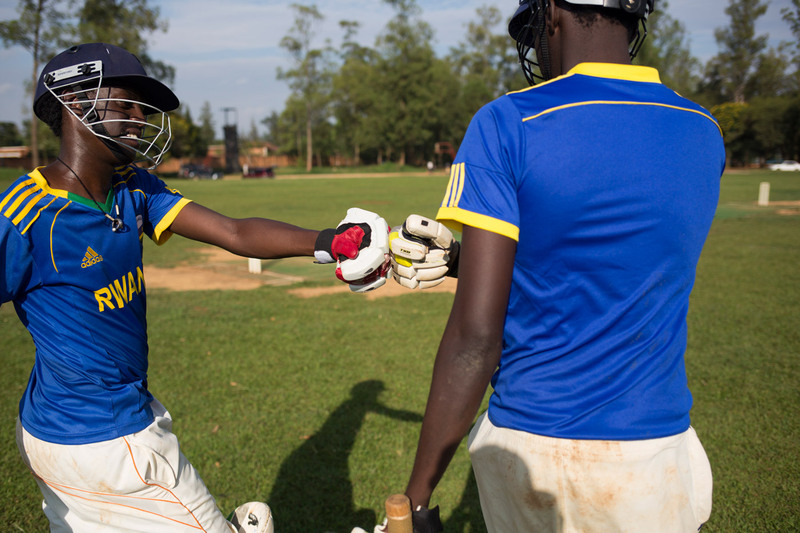 A cricket coaching clinic at Giporoso Primary School, where Rwanda national team cricketers and fringe players recruit new talent. With few facilities and no financial gain, Ndanga Erick runs the clinic and coaches new players out of passion for the game and its development. "You can play cricket on any flat surface but it is expensive for gear, so we need to provide everything," he says. "In football you only need a ball." Erick attended Giporoso himself and wants to do his best to keep cricket "alive" at the school. 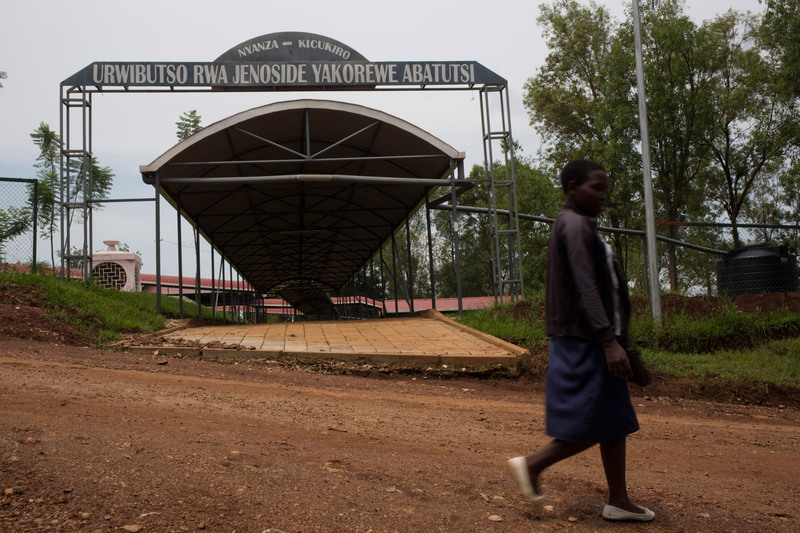 The Nyanza Genocide Memorial is situated about 3.3 kilometres from the IPRC. About 11,000 victims were buried here. "It wasn't uncommon to find human remains at the boundary when we were playing here," says Haba of playing at the IPRC. "It is a reminder of our past, a devastating reminder." The new cricket stadium in Rwanda will be built in Gahanga, on the outskirts of Kigali. Construction is set to begin in the next few months. 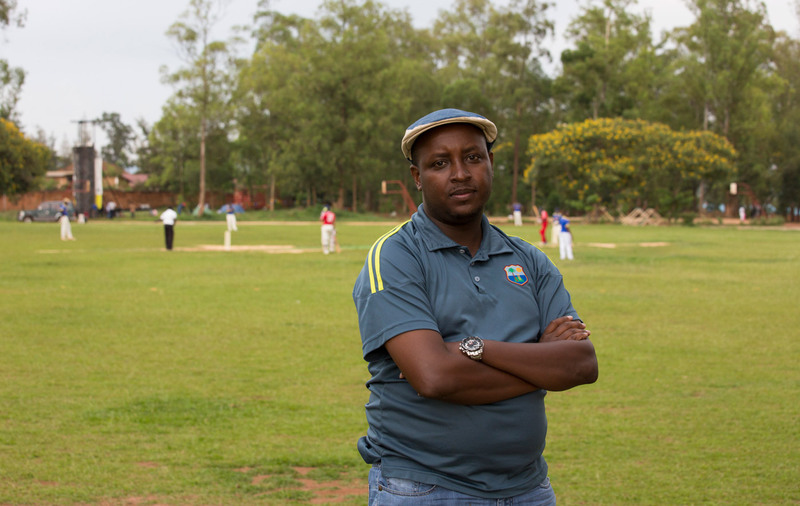 Dusingizimana is also a general manager of the Rwanda Cricket Stadium Foundation. "There is 4.5 hectares of land here for two cricket ovals and pavilions and cricket nets," he says. 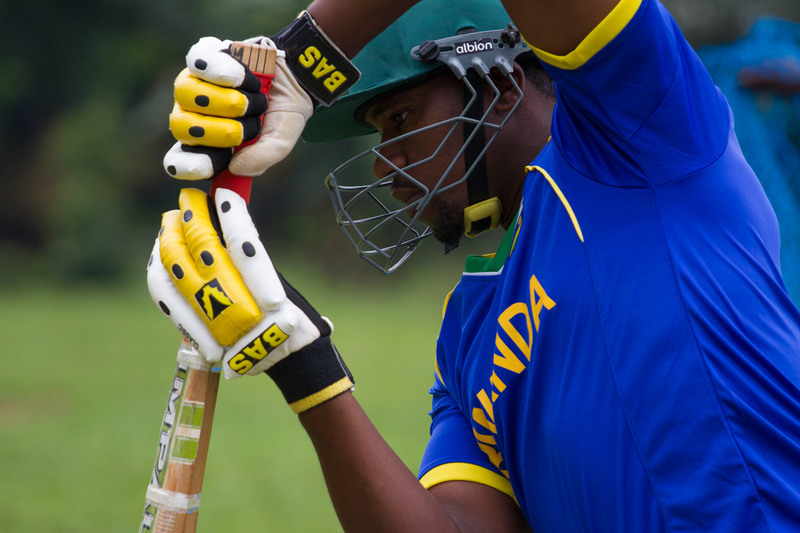 "It will be an asset for Rwanda Cricket and allow us to develop further as a cricketing nation." Last month Dusingizimana raised funds for the stadium and made headlines by breaking the world record for the longest individual net session. He batted for 51 straight hours, facing deliveries from, among others, former British prime minister Tony Blair; the British high commissioner to Rwanda, William Gelling; and Miss Rwanda, Jolly Mutesi. Bashir and "Tall" Eric (right) head out to bat against their Ugandan opposition. Eric has been playing cricket since 2005 and made his national debut in 2006. He is also an ambassador for Cricket Without Boundaries, an organisation set up to promote the game across developing cricketing nations. He remembers walking from Gitarama in the Southern Province to Kibuye, near the Congo border, to escape violence during the 1994 genocide. "It was tough for us, and when you know the killers wanted to come back after they have killed your wife, your family and now they want forgiveness, it was very difficult to give."